We are equipped to scan found animals for microchip identification and we do not charge anything for this service. Most veterinarian’s offices can do this. If the found pet has a microchip, it may be possible to trace the pet to his or her owner. If you have found a pet wearing one of our rabies vaccination tags, write down the rabies tag number and the year on the tag. 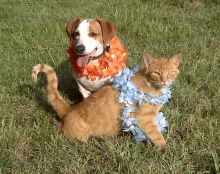 Call us during office hours and we can assist you in looking up the owner of the pet wearing the collar. If it is wearing a rabies tag from another veterinarian’s office, write down the tag number and call their office. We do not keep/house found pets here at Holmes Veterinary Hospital. We are a private animal hospital, not a shelter, rescue or pound. If you cannot keep a found pet, contact a shelter, rescue or pound. Secure fences, collars and leashes. That you have a collar with an identification tag and rabies tag on your dog at all times. Cats should wear break-away collars. That you have a microchip put into your pet. We can do this here at Holmes Veterinary Hospital.